So we’ve just returned from a magical weekend in Rome which has re-ignited our love for pizza and all things carb-related. We usually try to be healthy and exercise some kind of self-restraint, but before we went, we vowed to go to town on Italian food. And we really did. We dined on beautiful pasta, chocolate and nocciola gelato, deep-fried courgette flowers and salt cod (Roman specialities), pizza (of course!) and discovered a cake made up almost completely of Nutella ganache (crostata di gianduia, a true revelation). Now that we’re back in London, it’s fair and accurate to say that we’re avoiding the scales big time. 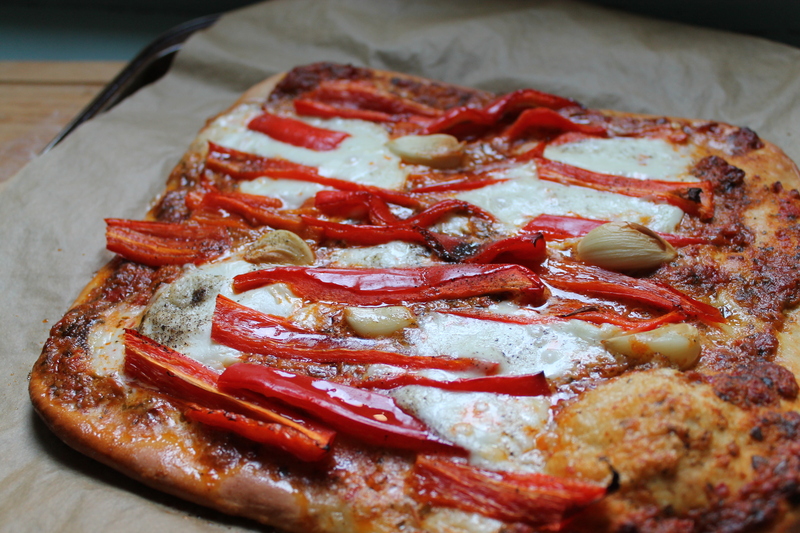 And although we are almost back to our normal routine, we thought we’d remember our trip by creating our own slightly healthier version of the Roman pizza we tried – and made it square (so much easier to divvy up and just like the Roman pizza al taglio!). In a jug, add the yeast, sugar and warm water. Stir and leave for 5 minutes – the mixture should become slightly frothy. In a mixing bowl, add the flour, salt and oil. Add the water mixture and stir until incorporated. Turn the dough onto a well-floured surface and knead for 5-10 minutes until it becomes smooth. Place the ball of dough into the mixing bowl again, cover with a clean tea towel and leave in the warmest place in your home for at least 1 hour. Punch the dough down into the bowl and then turn onto a floured surface. 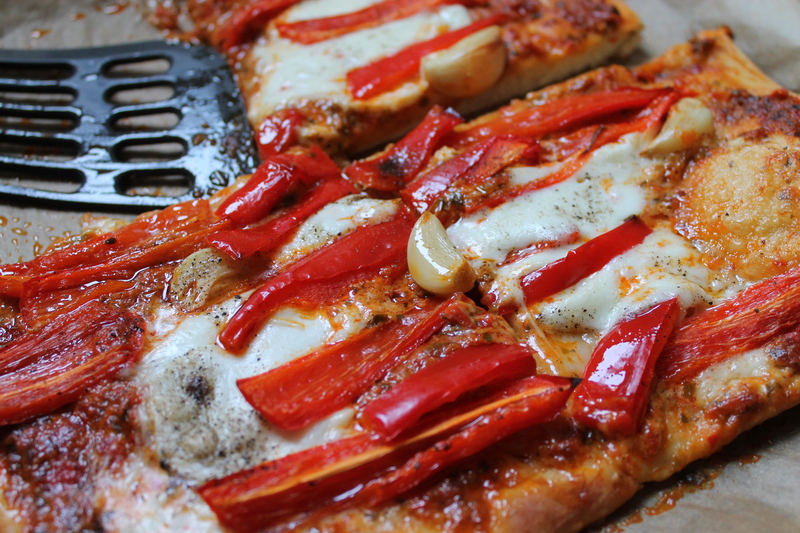 Line a baking tray with parchment – unconventional but foil or an oiled baking tray still seems to result in the pizza sticking for us! Using your hands or a rolling pin, push the dough out in a square shape. The dough should be quite thin, about 2 cm thick. Spread the pesto over the base. Then add the mozzarella, red pepper, garlic and pepper to taste. Enjoy immediately, possibly with a San Pellegrino. Buon appetito! This looks wonderful! Can’t wait to try it out in the future!